These are lyrics by Robert Earl Keen that we think are kind of funny. 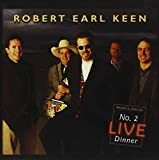 Robert Earl Keen's, "Merry Christmas From The Family"
An all-around hilarious song. It was difficult to pick the best lyrics, but these straightforward first lines provide a fitting introduction to the song. Anyone that appreciates good Americana lyrics needs to hear this song.